The entryway to your house provides most guests with their first impression of your home. It provides you with a hopefully warm welcome when you return after a hard day’s work as well. If you’d like to make your entryway more inviting, more elegant, and add serious value to your home at the same time – then you might consider adding some stained glass panels to the front door itself. Scottish Stained Glass has been helping homeowners enhance the beauty and value of their homes for over twenty years. Entryways are one of the most popular places to place stained glass. If when you hear stained glass, you automatically imagine bright colors. But colored glass is just one of the kinds of Houston stained glass doors we offer. Even more popular are clear, uncolored glass with various degrees of texture and opacity. You can choose from many beautiful designs and styles, or work with one of our designers to create your own. Beveled glass and etched glass are also popular with Houston homeowners. Along with giving your home a spectacular entryway, these windows provide more privacy, so strangers at your door cannot see into the house. 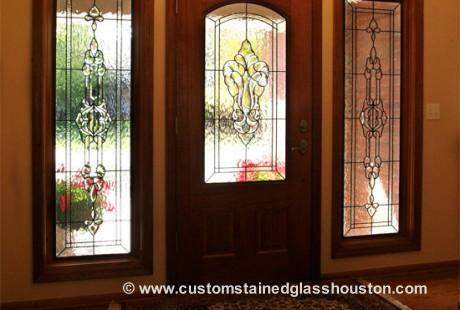 Not just for Houston stained glass doors, our custom stained glass can also be used for the sidelights next to your front door, the small window you might have above the door, or a transom window. Benefits of Houston Stained Glass Doors – More Than You’d Imagine! And with stained glass doors, there is no limit to what we can do to improve the beauty of your home. How about a stained glass panel with grapevines on your wine cellar door? Or stained glass for more privacy on your sliding patio door? Or have you considered the elegance of a leaded glass shower door? Stained glass provides a level of distinctiveness that’s the perfect antidote to the many Houston developments filled with row after row of identical houses. Scottish Stained Glass doors in Houston allow natural light to enter your home, raises your homes retail value, provides uniqueness, affords an extra level of insulation and provides more privacy — all wrapped up in a beautiful package that will delight you for years to come. A designer from Scottish Stained Glass will come to your Houston home and work with you on the design of your stained glass doors or windows. Please browse this website to see many stunning examples of our work, and be inspired. Whether you wish to choose a modern and contemporary style stained glass door or an Art Nouveau or Celtic style door, we can produce any style you like. We will work with you on cost concerns as well. You might be surprised to hear that the cost of a stained glass door in Houston could be as low as $100 per square foot. Your stained glass will be locally produced by a trained Texas artisan, and installed by our experienced local installers. 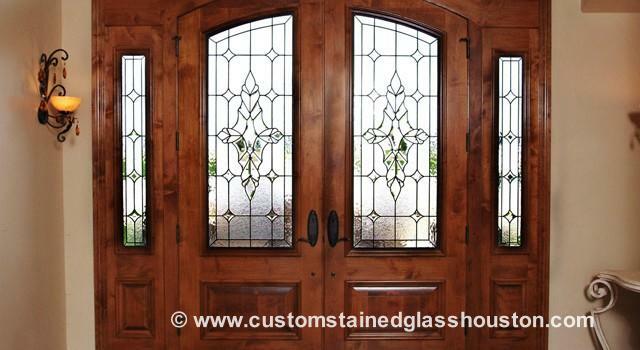 Please contact us today to schedule a free consultation in your home, or get a general estimate as to pricing for your Houston stained glass doors. We know you’ll be delighted with our quality, craftsmanship and best of all, the look of your home!